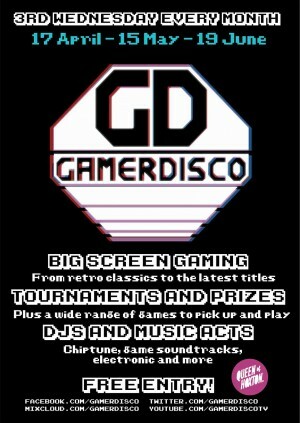 GamerDisco returns to QUEEN OF HOXTON for a night of big screen gaming, tournaments, music and more! FIND US DOWNSTAIRS IN THE BASEMENT! This month, we've got a double bill of blockbuster violent video game franchises your parents warned you about as a kid (provided you were born before 1990 I guess?) - MORTAL KOMBAT and DOOM! With Mortal Kombat 11 just round the corner, we've decided to host an old skool kasual tournament of klassik MORTAL KOMBAT. We'll be playing the arcade kollection, so you can practice your fatalities across MORTAL KOMBAT, MORTAL KOMBAT II and ULTIMATE MORTAL KOMBAT 3 before kicking off our tournament. We won't be fighting for the fate of the world (necessarily), but there'll be a prize for the top kombatant in any case. Then, we'll see you in Hell - DOOM style. We'll have a DOOM II multiplayer match-up, with it's fast-paced first-person fragging fun. Chainsaws and BFGs at the ready, it's gonna get messy! If you like your games with less gratuitous violence and more comic book style violence, we've got MARVEL VS CAPCOM 2 and MARVEL VS CAPCOM 3 available to play. With Avengers: Endgame in cinemas this month, it's about time we brought back the mashed-up beat-em-up with its roster of superheroes ripped from the pages of Marvel comics doing battle with some of Capcom's best-loved characters. Don't worry though, we'll have some more sedate options, with a range of retro and inde titles on freeplay too! RSVP to the event to keep updated!